Nowadays everyone trying to eat more healthy and like everyone else I am trying to cut down on sugar and consume it in moderations. I have heard about this great product called Xagave (pronounced Za-gah-vay) that is an organically grown premium blend of nectars derived from Agave Tequiliana (Blue Agave) and Agave Salmiana (White Agave) plants. It is an answer to all the blood sugar woes. Xagave offers a number of health benefits over regular processed sugar; including calorie savings, fiber and calcium content, and low glycemic index. A lot of people are reluctant to try sugar substitutes in their recipes because they are worried about loss of flavor and after taste but Xagave is different. It has a mild and perfectly sweet flavor making it great for all kinds of drinks, dressing, sauces and baking. I bake these sweet bread using Xagave and the bread turn out so soft and moist. You can hardly tell that there is no sugar in the recipes. Thanks to the representative of Xagave for giving me the sample of this wonderful product along with the cookbook. 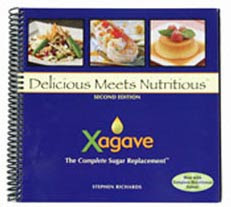 Xagave would like to give away a bottle of Xagave and the Delicious Meets Nutritious cookbook to one lucky winner. The giveaway will end on December 6th 2009 at 6.00pm (Eastern Time). All you have to do is leave a comment with your email address here and I will randomly draw the winner . GOOD LUCK!! 4. At this stage you can shape your dough into any shape you like. Cover with plastic wrap for 1 hour or till double in size. Brush the tops with an egg wash to get that shiny coating. Sprinkle with some sesame seeds or poppy seeds. 5. Bake in a pre-heated 350 degree F oven for 15-20 min (depend on the size of your buns) or until golden brown. I'm looking for sugar substitutes as well. I love baking and unfortunately I love baking sweet stuff like cakes and rich desserts. I would love to try out Xagave. Thanks! Thanks so much for the opportunity to win the Xagave! I can't wait to try it. cool idea. I never like food or cake too sweet. I always try to find way to cut down on sugar. Thanks for sharing. Those buns look good and perfect with to be downed with bowls of hot soup on cold, cold winter days!! Soft and fluffy buns! Xagave is interesting. Sounds like a wonderful giveaway! I love agave nectar. I've wanted to try agave for a while. I normally use honey with tea and such, but have heard that agave is better. Agave nectar. I havent heard of it. It would be something new to try. Bun looks yummy...would love to give xagave a try..thanks! Would love to have sugar in my recipes if only i can get my hand on xagave. Haven't seen them. This is a great subsitute for white sugar, especially when one is not getting any younger. I would love to try this products. I wonder if it's available in Canada? What a lovely roll!! I never knew about Xagave.. great to learn this product! Gertrude,your dinner rolls looks awesome!!! Please include me in your draw. Please include me in your draw too, because I want to bake some hearty bread for my family. Thanks ya. I have heard good things about agave nectar. I would love to try it! I am a diabetic so I have to be careful with sugar substitutes, but the other day I was watching Dr. Oz and he was talking about Agave. He said it is very good to use in diabetic cooking as it doesn't raise Blood Glucose like sugar and most substitutes. Well, I asked my care physician and she said yes, go ahead and try it and see how it works for me. My problem is finding the stuff. But I would truly appreciate this cookbook. Sure hope delivery covers your home country, Malaysia! Sounds interesting! Would love to have a bottle to try! I just bought a Healthy Cupcake recipe books and saw one of the ingredient called Blue AGave. I was wondering what is that and where can i find it. Now i know what is it and thanks for your posting. I don't think I've seen this before. In any case your rolls look really scrumptious - so soft and fluffy. And it'll taste great with some cold butter! Yum. I always hear about agave nectar but have never tried it. Would love to get the chance! I actually like the taste of agave more than honey; when eaten straight, agave leaves a cleaner and smoother after taste that is light and not at all sticky. Is Xagave the same? I frequently read ur blog and find it interesting. Today, this agave nectar has made me curious to leave u a comment. Sounds healthy, would love to try it. These buns look delicious and they're nutritous too. Dinner rolls looks soft and fluffy. I think Xagave is catching on,so many others bloggers too are blogging abt it! These look divine. Glad you shared the recipe. Me!! Me!! Me......!!! I want it!! I'd love to try anything that substitutes sugar. coming from a family of diabetics, sugar intake is major concern to me. so please include me in your draw. i live in malaysia, btw. love your blog. u're a very skilled cook, everything u make looks great! My best friend swears by agave (since she can't have sugar) I'd love to try it. Those rolls looks so good. I have been wanting to try sugar alternatives that are more natural...not chemically altered. My father is a diabetic and loves sweets. I would love to win this for him. I am all for sugar substitutes. My mother keeps telling me to try agave-based substitutes in my baking, but to be honest: it never really sounded good until I read this post. Maybe I'll give it a go after all! An affordable agave product is IMPOSSIBLE to find here! It would be neat to see how it works in bread! I would love to try this. I am always trying to cut down on the amount of sugar in our diets. I hope I'm not too late. I'd really LOVE to have a bottle of Xagave as I'm a real health freak. I like eating sweet breads and cookies but don't like using refined sugar as I know sugar is our immune system's enemy. With this wonderful product, my kids, hubby and I can savely enjoy our homemade breads, cakes, cookies and other food without any guilt!